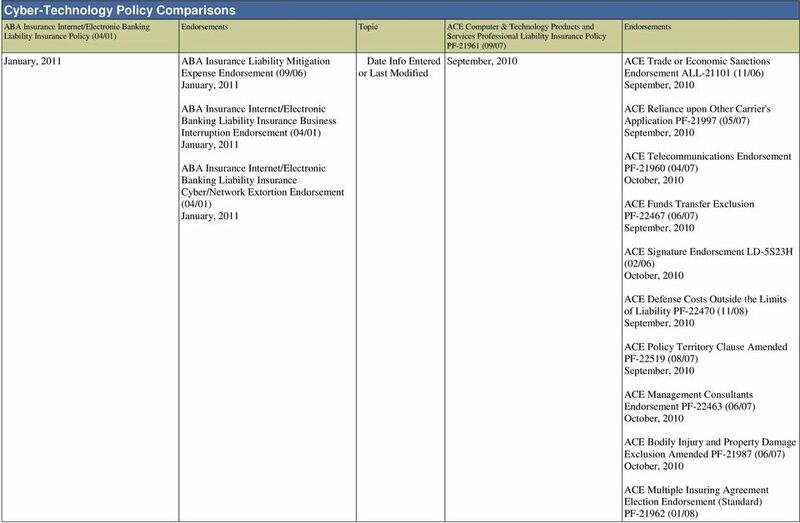 2 October, 2010 ACE Definition of Technology Services Amended Information Technology Staffing and Placement PF (05/07) October, 2010 ACE Intellectual Property Violations Sub-Limit of Liability Insuring Agreements A and B PF (02/08) September, 2010 New Version Policy Comparison Template Version Used New Version Internet-Electronic Banking Types of Risks Technology Consultants and Service Providers Negotiable Maximum Limit Negotiable INTERNET/ELECTRONIC BANKING LIABILITY INSURANCE POLICY THIS IS A CLAIMS MADE POLICY WRITTEN ON A NO DUTY TO DEFEND BASIS. 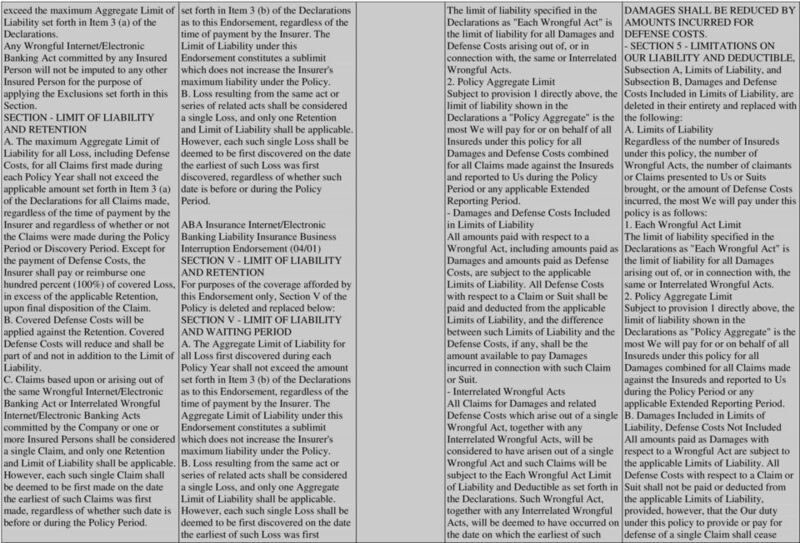 DEFENSE COSTS ARE INCLUDED WITHIN THE LIMIT OF LIABILITY. 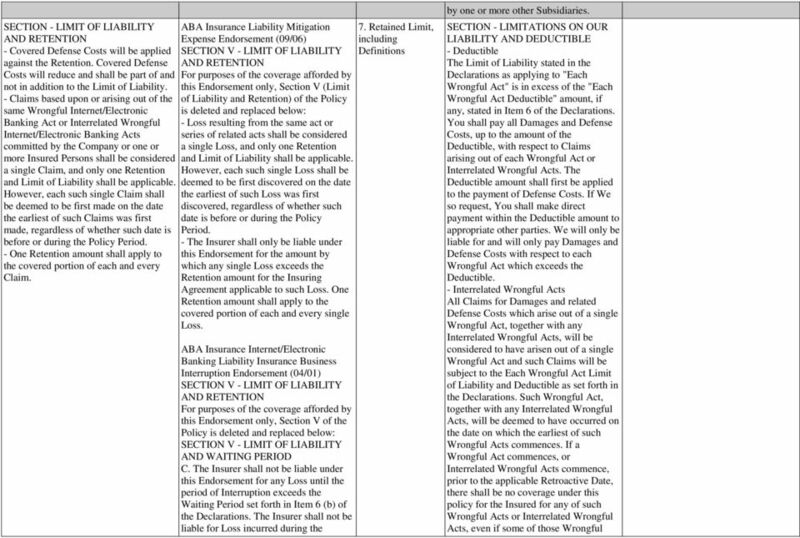 AMOUNTS INCURRED AS DEFENSE COSTS WILL REDUCE THE LIMIT OF LIABILITY AVAILABLE TO PAY JUDGMENTS OR SETTLEMENTS. PLEASE READ YOUR POLICY CAREFULLY. 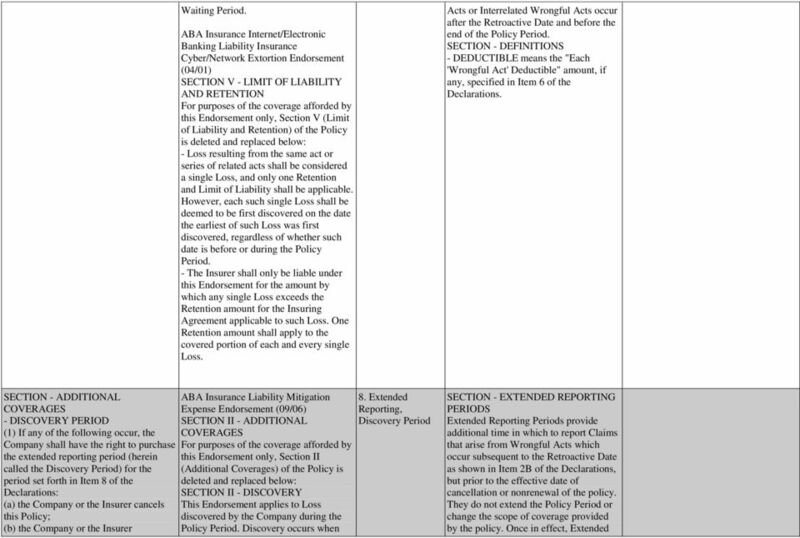 In consideration of the premium paid and in reliance upon all statements made in the Declarations and Application, the Insurer, the Insured Persons and the Company agree that coverage will be provided subject to all of the terms, conditions and limitations of this Policy, as follows: ABA Insurance Liability Mitigation Expense Endorsement (09/06) In consideration of the premium paid and in reliance upon all statements made and information contained in the Declarations and Application, the Insurer and the Company agree that coverage will be provided subject to all of the terms, conditions and limitations of this Endorsement as follows: ABA Insurance Internet/Electronic Banking Liability Insurance Business Interruption Endorsement (04/01) In consideration of the premium paid and in reliance upon all statements made in the Declarations and Application, the Insurer and the Company agree that coverage will be provided subject to all of the terms, conditions and limitations of this Endorsement as follows: 1. 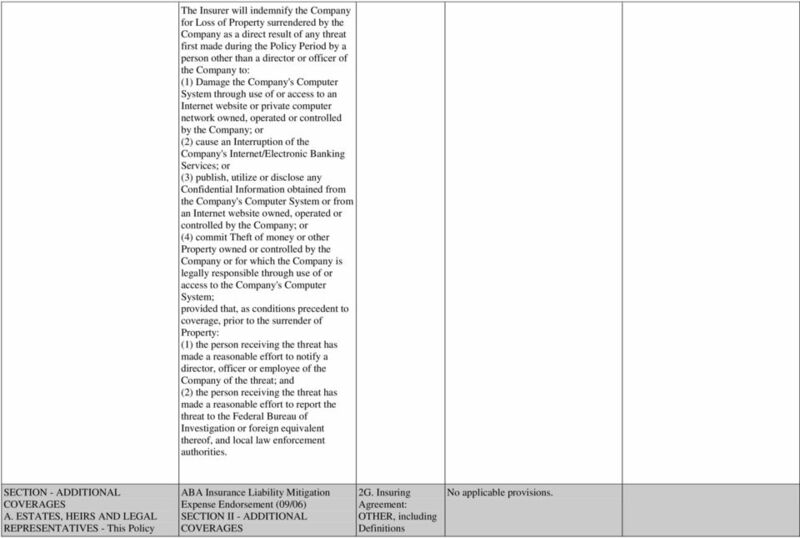 Form Title; Preamble COMPUTER & TECHNOLOGY PRODUCTS AND SERVICES PROFESSIONAL LIABILITY INSURANCE POLICY IMPORTANT NOTICE PLEASE READ THIS POLICY IN ITS ENTIRETY. 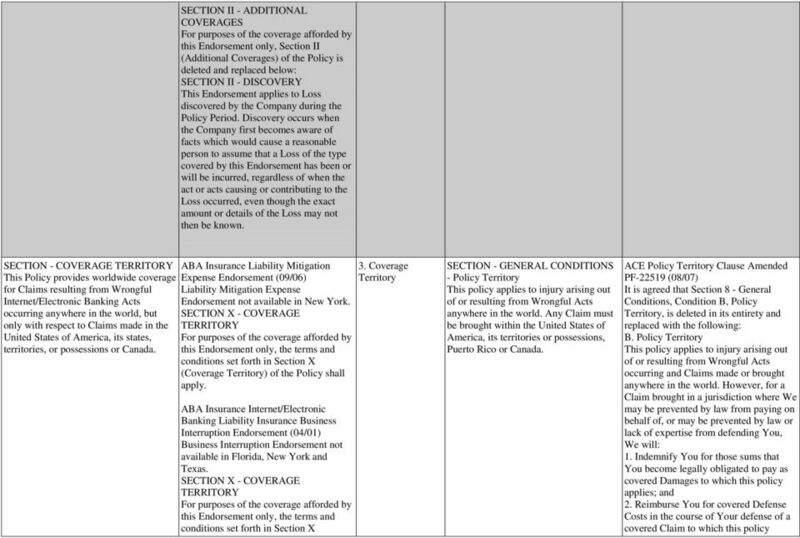 SOME OF THE PROVISIONS CONTAINED IN THIS POLICY RESTRICT COVERAGE, SPECIFY WHAT IS AND IS NOT COVERED AND DESIGNATE RIGHTS AND DUTIES. 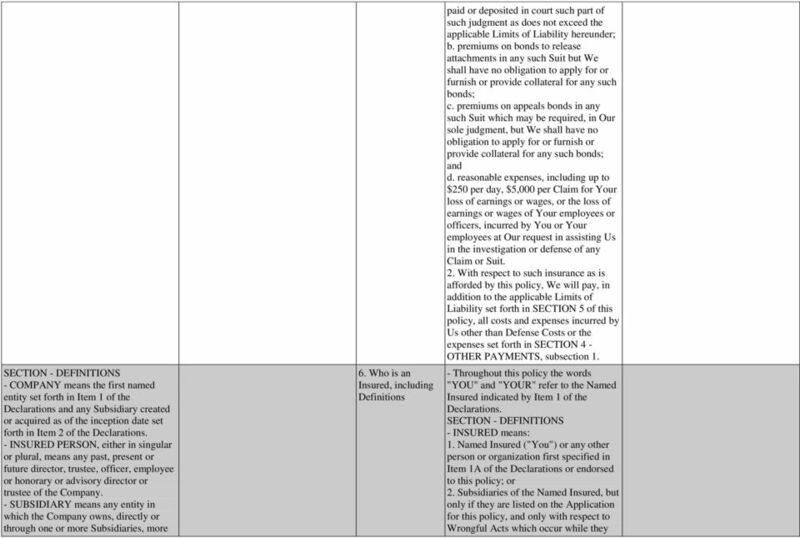 Throughout this policy the words "You" and "Your" refer to the Named Insured indicated by Item 1 of the Declarations. 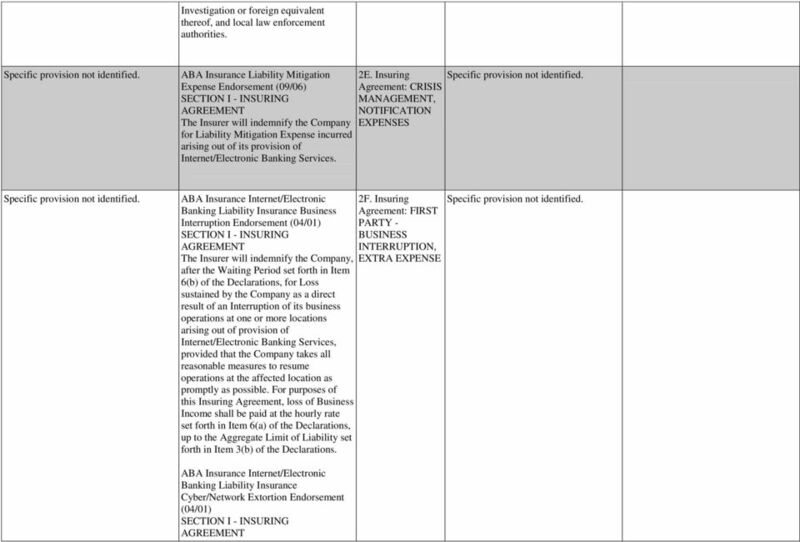 The words "We", "Us" and "Our" refer to the Company providing the insurance. Other words and phrases that appear in bold print have special meaning. Refer to SECTION 1 -- DEFINITIONS. 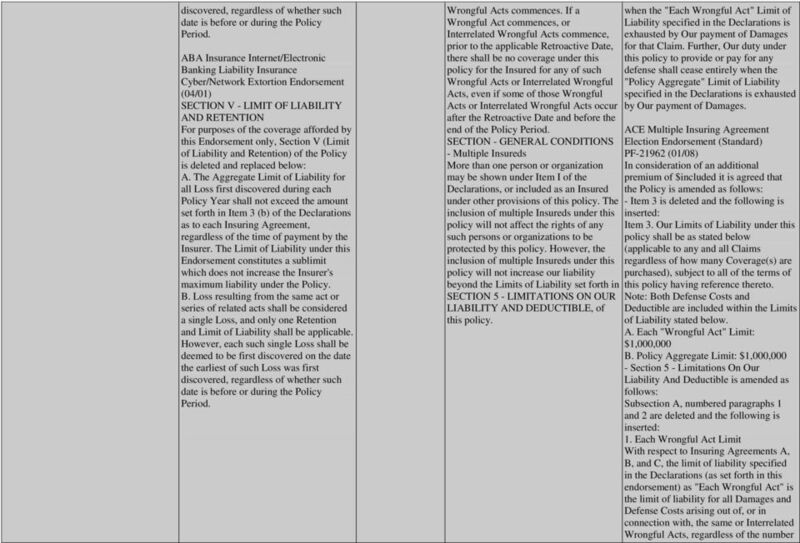 THIS POLICY IS WRITTEN ON A "CLAIMS-MADE-AND-REPORTED"
5 Insured Persons and/or the Company, Loss in excess of the applicable Retention and up to the applicable Limit of Liability resulting from Claims first made during the Policy Period against the Insured Persons and/or the Company for which they are legally obligated to pay for Wrongful Internet/Electronic Banking Acts involving: (1) invasion of privacy; (2) libel, slander, defamation or other actionable oral or written disparagement; (3) loss or damage to Electronic Data of a customer; (4) denial, impairment or interruption of service; (5) loss of business opportunity; (6) unauthorized access to a customer account maintained by the Company; (7) infringement of copyright, misappropriation of ideas (but not patent infringement) or plagiarism; (8) infringement of trademark, trade name or service mark; or (9) other causes of action arising directly out of the provision of Internet/Electronic Banking Services by the Company. 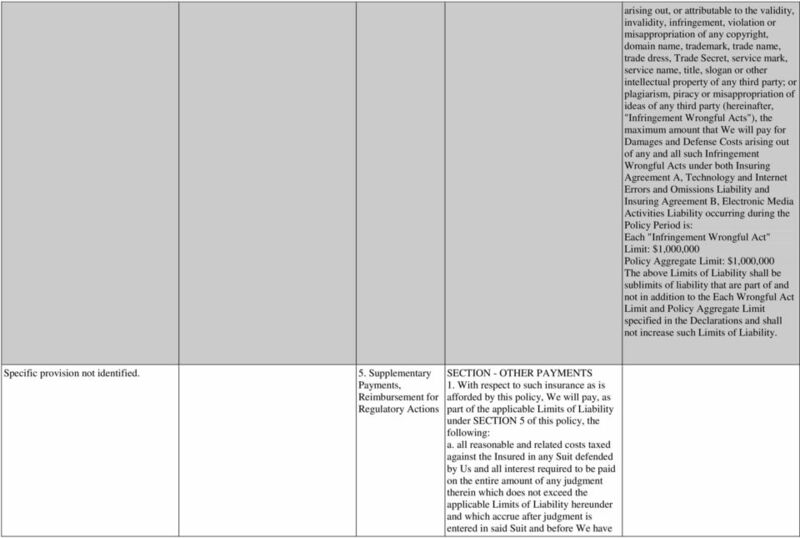 CONTENT In consideration of an additional premium of $included it is agreed that the Policy is amended as follows: - The Declarations is amended as follows: The following Item 7 is added to the Declarations: Item 7. 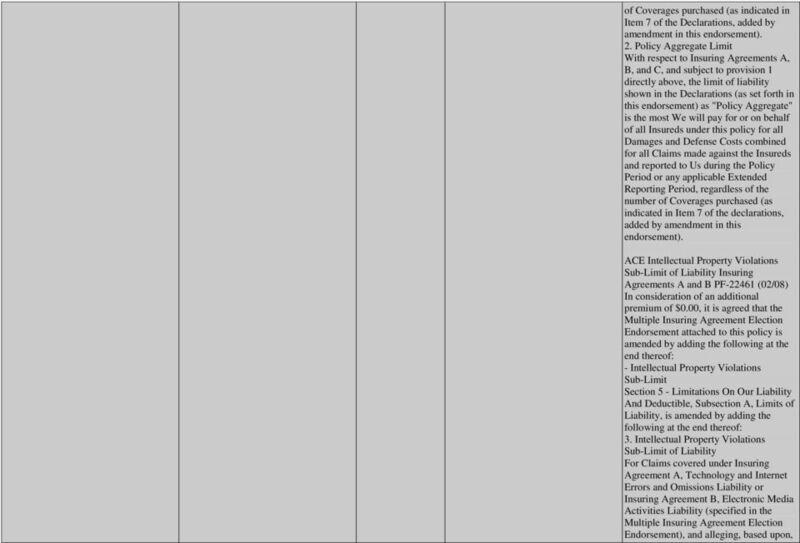 Coverage(s) Purchased ("X"): X A. Technology and Internet Errors and Omissions Liability X B. 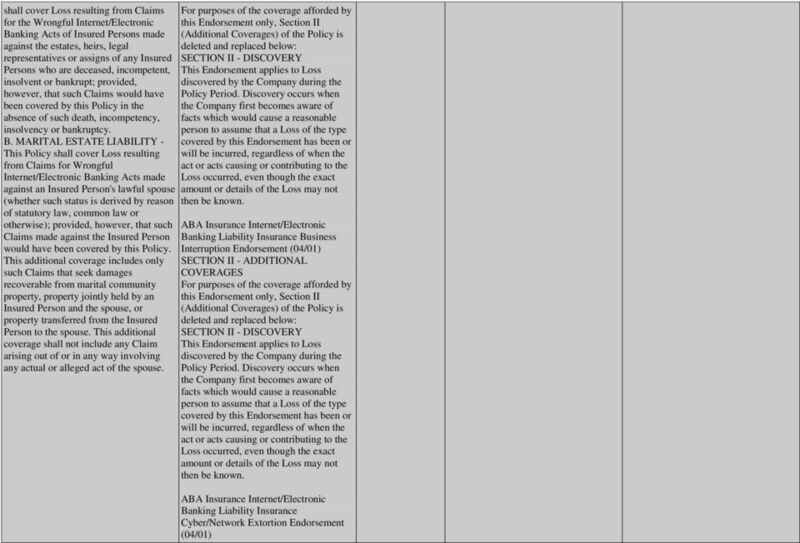 Electronic Media Activities Liability X C. Network Operations Security Liability (note, the Unauthorized Access and Unauthorized Use coverage afforded hereunder is limited to the Insured's Computer System) - Section 2 - Coverage Agreement is deleted in its entirety and the following is inserted: SECTION 2 - COVERAGE AGREEMENTS B. 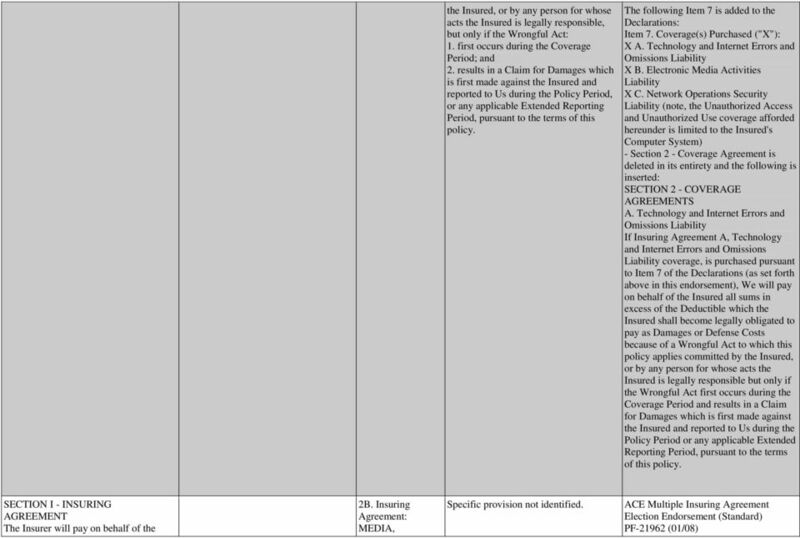 Electronic Media Activities Liability If Insuring Agreement B, Electronic Media Activities Liability coverage, is purchased pursuant to Item 7 of the Declarations (as set forth above in this endorsement), We will pay on behalf of the Insured all sums in excess of the Deductible which the Insured shall become legally obligated to pay as Damages or Defense Costs because of a Wrongful Act to which this policy applies committed by the Insured, or by any person for whose acts the Insured is legally responsible but only if the Wrongful Act first occurs during the Coverage Period and results in a Claim for Damages which is first made against the Insured and reported to Us during the Policy Period or any applicable Extended Reporting Period, pursuant to the terms of this policy. 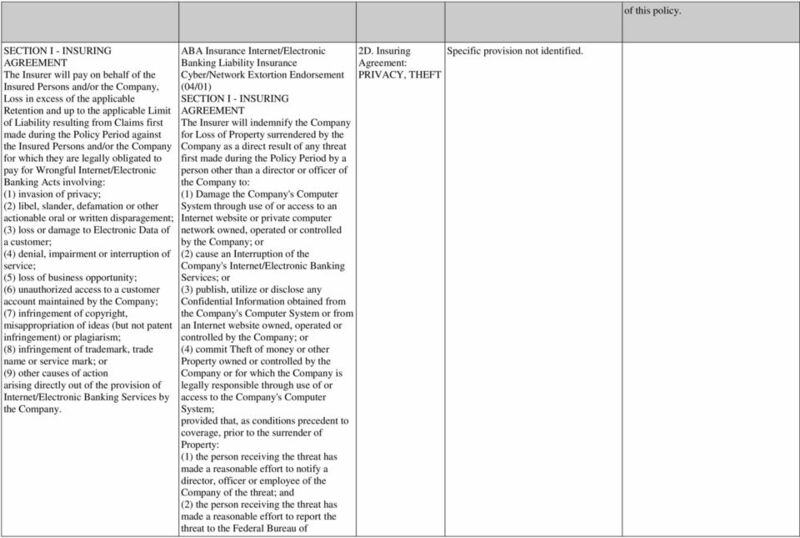 9 The Insurer will indemnify the Company for Loss of Property surrendered by the Company as a direct result of any threat first made during the Policy Period by a person other than a director or officer of the Company to: (1) Damage the Company's Computer System through use of or access to an Internet website or private computer network owned, operated or controlled by the Company; or (2) cause an Interruption of the Company's Internet/Electronic Banking Services; or (3) publish, utilize or disclose any Confidential Information obtained from the Company's Computer System or from an Internet website owned, operated or controlled by the Company; or (4) commit Theft of money or other Property owned or controlled by the Company or for which the Company is legally responsible through use of or access to the Company's Computer System; provided that, as conditions precedent to coverage, prior to the surrender of Property: (1) the person receiving the threat has made a reasonable effort to notify a director, officer or employee of the Company of the threat; and (2) the person receiving the threat has made a reasonable effort to report the threat to the Federal Bureau of Investigation or foreign equivalent thereof, and local law enforcement authorities. 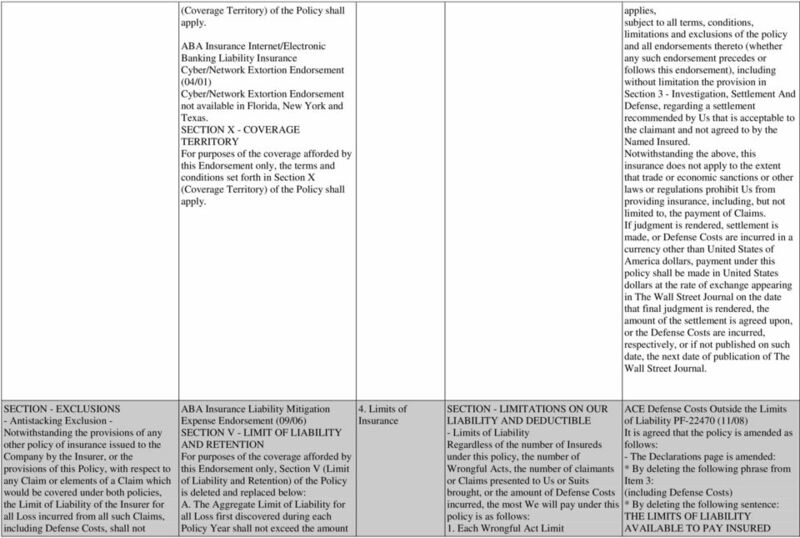 SECTION - ADDITIONAL COVERAGES A. ESTATES, HEIRS AND LEGAL REPRESENTATIVES - This Policy ABA Insurance Liability Mitigation Expense Endorsement (09/06) SECTION II - ADDITIONAL COVERAGES 2G. 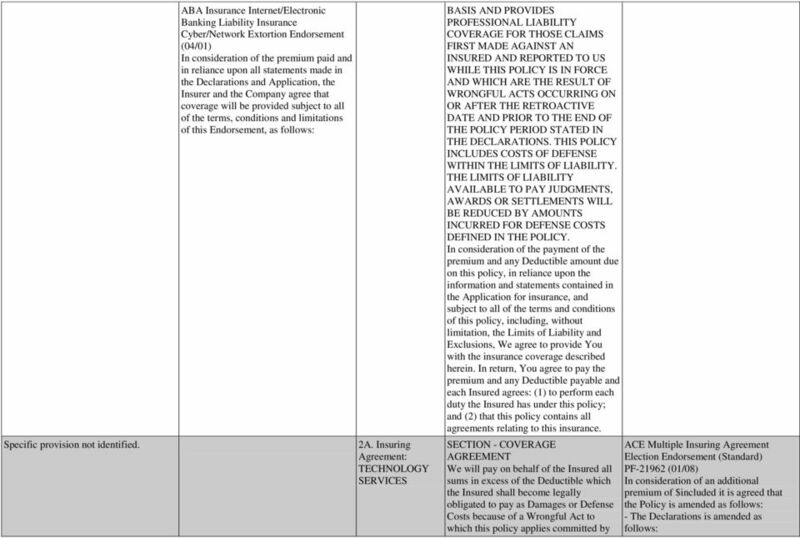 Insuring Agreement: OTHER, including Definitions No applicable provisions. 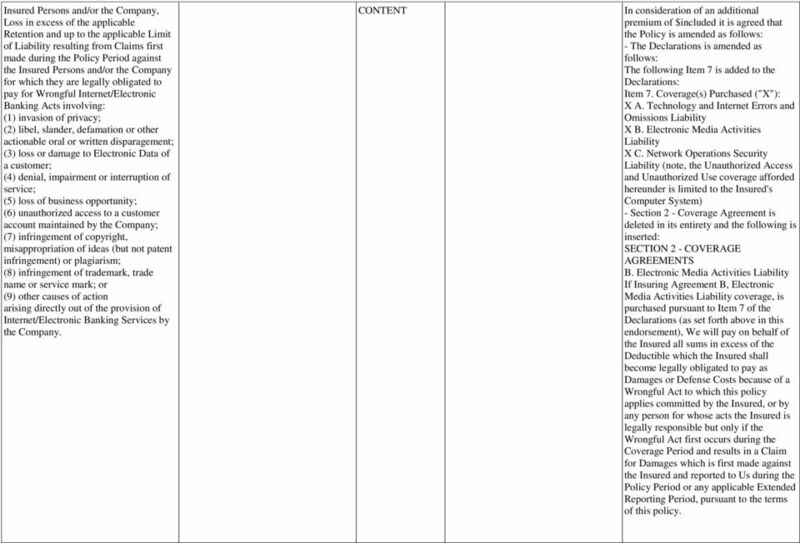 Specimen THIS IS A CLAIMS-MADE COVERAGE WITH DEFENSE EXPENSES INCLUDED IN THE COVERAGE LIMITS. PLEASE READ THE POLICY CAREFULLY. 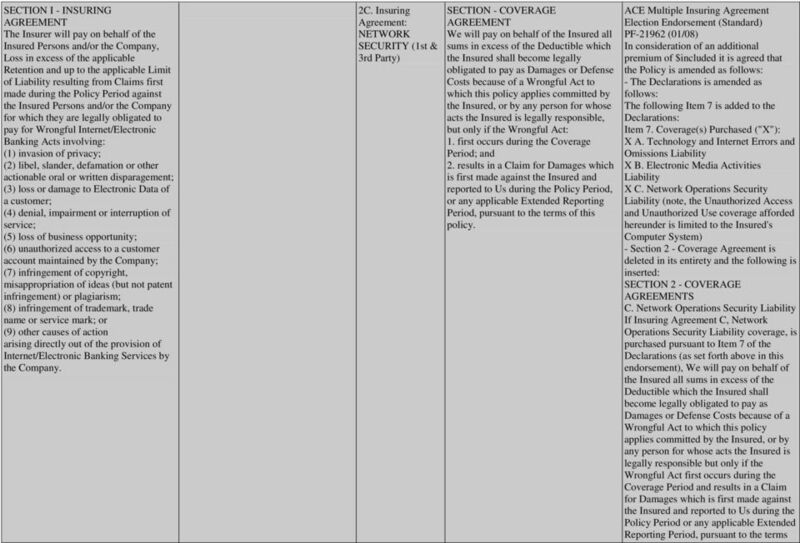 MANAGEMENT LIABILITY AND COMPANY REIMBURSEMENT INSURANCE COVERAGE FORM THIS IS A CLAIMS MADE POLICY WITH DEFENSE EXPENSES INCLUDED IN THE LIMIT OF LIABILITY. 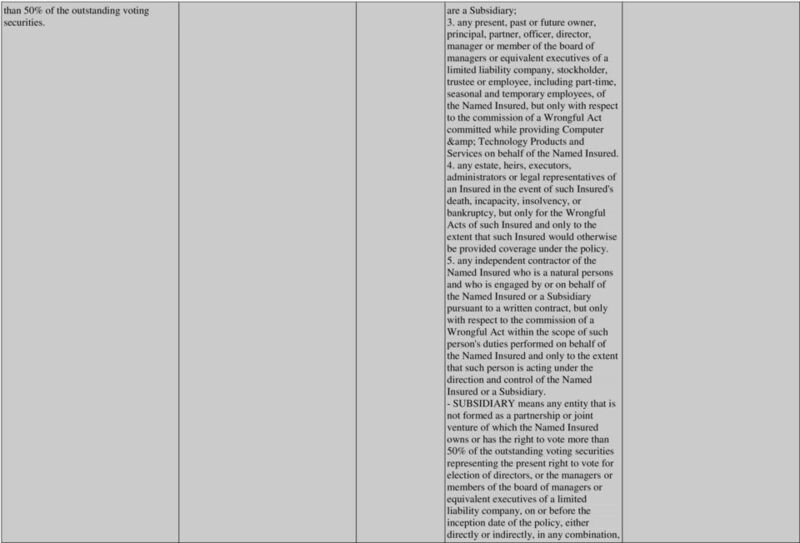 PLEASE READ AND REVIEW THE POLICY CAREFULLY. 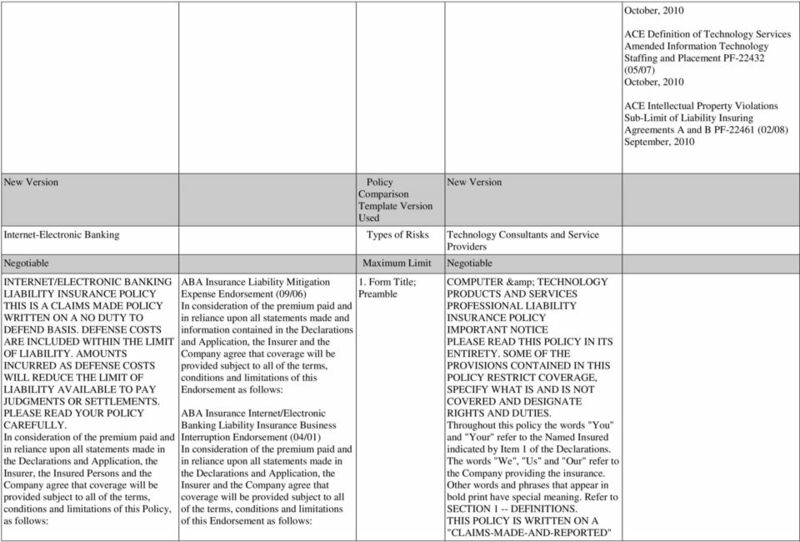 A Stock Insurance Company, herein called the Company FIDUCIARY LIABILITY INSURANCE POLICY THIS POLICY APPLIES ONLY TO CLAIMS FIRST MADE AGAINST THE INSURED DURING THE POLICY PERIOD OR DISCOVERY PERIOD.